Toys! Kids! Utter chaos, amiright?! Those without kids give the old eye roll and tend to snicker when it comes to this topic, but reality with small children is as such. It’s pretty nuts, the toy situation, and it can get out of control fast if you let it. With the arrival of little ones comes the constant trickling in of all their little things, and then a whole bunch of stuff on top that. Oy. I just cleaned the couch out and found an entire outfit to dress a barbie and enough legos to build a rocket ship. You see, I know a thing or two about all of this, and if you have a kid or two or five I am betting you do too. I have found that it takes all of about a few hours for one’s home to become a giant storage container for toys and games and all things kiddo. If you’re anything like us, your baby had more stuff than you before they were even born. Probably because a list said you needed it. And you obliged. I’ve been there. Thanks, Target. But now you’ve realized you really don’t need a bottle warmer or five plastic music makers and forty stuffed animals just isn’t really necessary. Just a few nice things will do and perhaps, just a few quality toys will even make playtime better. And because Christmas is coming up, let’s talk about this. So how does one maintain a simple, joyful, decluttered home and not have toys scattered in a mess everywhere, yet keep one’s home a place that invites creativity and imagination and playtime? This is a question I get a lot as it’s something we take the time and work to tend to on a regular basis doing our best to prevent our home from becoming cluttered and thoroughly disorganized. Andrew and I have learned it takes a bit of strategy and discipline to manage this as to not become so overwhelmed with all the stuff. Hopefully this post will help break down how we do what we do when it comes to storing toys (and their other tiny things) in our home for our three children. Simple is calming and we like it that way. To start, it’s worth mentioning that we moved to our current home from a less than eight hundred square foot condo where storage was majorly lacking. Tiny closets and close to no built-ins resulted in us getting very creative with how we stored everything, toys included. In addition to storing creativly, we also grew to be fairly ruthless when it came to what we even allowed up those steep three flights of stairs. If we loved it, if it brought us joy (or “sparked joy” if you follow Marie Kondo), if we need to use it, up it came. Everything else got the boot, more or less. This mindset helped us pair down to the essentials, and then some, when nesting and in keeping of our small tree house home. We’ve used the same intentional approaches here in this home, despite it being much larger and more accommodating to a family of five. In addition to this essentialist discipline, we approach gifting a bit differently than most as well. Instead of getting the kids dozens of toys for birthdays and holidays etc., we get them just a few thoughtful gifts along with some practical items, with a much larger emphasis on experiences and fun things to do out and about in this city, like ballet lessons or an art class or tickets to a play. This makes for less stuff on those all to familiar toy-crazed occasions. I am working on a post about gifting where I will address more of the specific on this, so stay tuned for that. Now let’s chat about what to do after your kids have received their toys. Where do they go? How does one thoughtfully store them? And it is worth keeping organized? I’ll answer that one right off the bat for ya, YES. It will make your home so much more calming and peaceful. To address the other questions, I have one beautiful word for you: baskets. I feel if you’re going to be am item and will be looking at it everyday, why not make it pretty, right? Over the years I have accumulated quite the basket collection, each of them a bit different but all made from lovely natural fibers. Some are tightly woven, others a folding over of gorgeous textures. We have them all over our home and in just about every room, each basket home to something most always kid related. By using natural fibers, you are bringing something beautiful into your home, giving it warmth and charm, while also creating a pretty and practical storage solution. 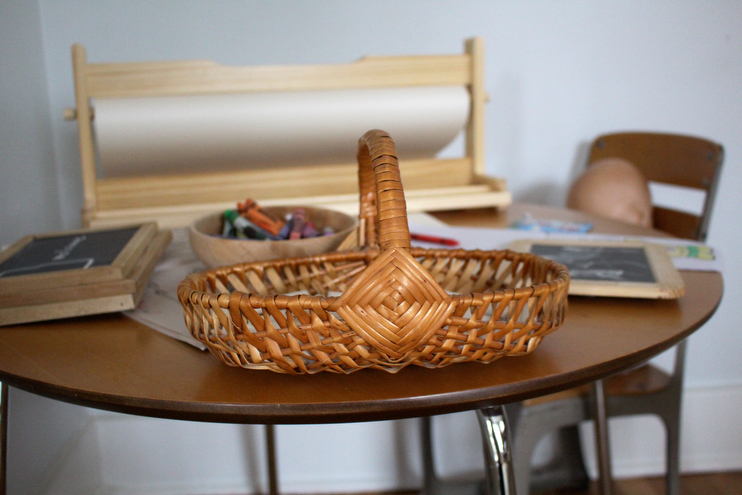 I love baskets with handles for things such like wooden blocks so the kids can pull it to where they want to build. We use smaller baskets and bins for small toys and keep those up on a shelf, easy to reach when wanting to play but tucked away and off the floor. For large toys, we like woven toy bins because of the magical fact it can be closed, giving the look of a polished room when the kids are not playing. Also important to note, we are careful not to keep too many baskets in one room, for this seems to present the issue of too many toys in one space, ultimately overwhelming the kids with what they can play with. 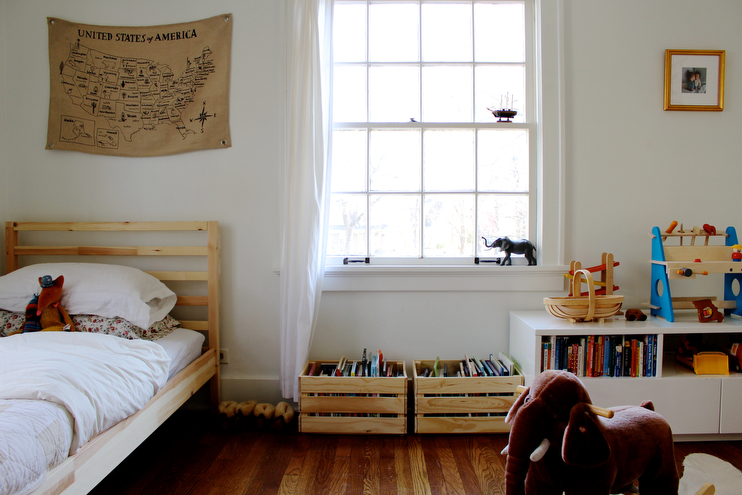 If you keep just a couple baskets per room, it makes both playtime and clean up go much more smoothly. So keeping all our toys in one space is not something that has really worked for us. Ultimately, they all get dumped out on the floor and one gigantic mess results with little to no playing. Perhaps you’ve experienced differently, and hopefully so, but this is why we choose to spread them about our home instead. What do we do for art/crafting supplies? Yes you guessed it, more baskets, but also clear mason jars too, for practicality’s sake. We store things to draw with in one place, construction paper in a big bin, and then random bits like pastels and paints and brushes in jars with lids. We keep these things well hidden in our dining room storage so it’s easily accessible since we do crafts just about everyday, but also out of sight because there’s nothing like a disarray of art supplies to make a room look cluttered. I like to keep these supplies within reach for Stella so she can use them whenever she wants, but our of sight to keep with our simple aesthetic. It works for us. And then there’s the old recycling toys trick, and boy this is a good one. Here’s my proposal to you, take all of your kids toys and bring them into one room, say a large space like your living room. Dump all of them out onto the floor, taking half of that large pile and donating them to a good home. You heard me correctly, get rid of half. Just be ruthless and edit that pile. You can do it, I believe in you. I recommend not doing this when your kids are around or they just may freak out when they see you getting rid of their things, even if they have not paid attention to those specific toys in years. I speak from experience on this. So i just waited until she was asleep, and you know what? She did not even bat an eye at all the toys that were missing. You should know just by being around your babes what they love and play with, so the sorting should go fairly fast. After getting rid of half of your preexisting toy pile, cut that smaller pile you have labeled as “the keepers” in half as well. Put those carefully selected items in a storage bin down in the basement or somewhere where your little ones will not find it. A few times a year you can do a swap and recycle the toys from the storage bin with those upstairs. It’s like christmas in july! Or whenever you decide to do it. The kids love this and are so much more engaged with their toys as opposed to having a hundred choices surrounding them, ultimately leaving them dissatisfied and bored. If you follow this trick, you’ll end up having one fourth of your existing child’s toys on display around your home, helping tremendously in terms of living more simply and mindfully with regard to your child’s toys. Where do i find my baskets and storage bins? Okay, that was a lot about toys and organizing. What other questions do you have? Happy organizing!